The Hudson Carriage House is a 3 car garage with a 750 sq. ft. studio above. 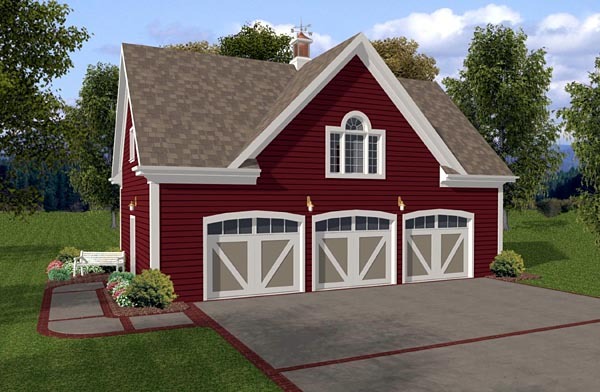 With siding exterior reminiscent of a country barn, this plan would be perfect temporary quarters during construction of your permanent home. Or it would be ideal for an in-law apartment, nanny quarters, college student apartment, etc. This design features an eat-in kitchen, a spacious family room, a bathroom and a bedroom with a roomy closet The laundry appliances are tucked beneath the stairs on the garage level with an optional laundry chute on the living level. Question: Are the footers 42"? Is there an expiration date to build after the purchase of the PDF. Answer: Slab is a monolithic slab. Footing depth is labeled “As Required” as per local frost level.